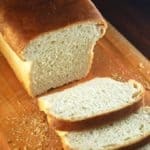 A wonderful, homemade sourdough sandwich bread with five ingredients and no added yeast. It's the perfect loaf -- fluffy and fresh and it slices -- and toasts -- beautifully. Place the sourdough starter in a large bowl or the bowl of a stand mixer. Add to it the wholewheat flour, 1 cup of all-purpose flour, and water. Mix well and set it aside, covered, in a warm place for four hours. Add 2 cups of all-purpose flour, olive oil and salt and mix. Add more flour as you knead until the dough becomes quite firm but still feels a little sticky to your fingers. Turn out the dough on the kitchen platform or any flat surface and knead by hand for 4-5 minutes or until the dough feels smooth and springy to your fingers and it barely sticks to the platform. Shape into a ball and place in an oiled bowl, turning the ball of dough around once to coat the top with oil. Cover tightly and place in a warm spot (like an oven with the light turned on) for at least two hours or until the dough has doubled. Punch down the dough and divide into two. Prep two standard loaf pans by spraying lightly with oil and then sprinkling on some cornmeal or semolina. Shape each portion of the dough into an oval. The dough should be very pliable and should shape easily. Place each loaf into the prepared loaf pans. Cover with a kitchen towel and let them stand in a warm place for at least two more hours or until the dough rises above the top of the loaf pans. About half an hour before baking, preheat the oven to 425 degrees. Place the loaves in the oven and bake 40 minutes. Remove the loaves from the oven, turn them out on a rack, and let them cool thoroughly before slicing. Recipe for sourdough starter here.